Every August, thousands of performers from around the world take over Scotland’s capital to present an amazing range of shows making this event the world’s largest arts festival - the “Edinburgh Arts Festival” combining the famous “Fringe Festival” and the “Edinburgh International Festival”. I’ve heard about the Fringe before - I mean, who hasn’t! - but I’ve never been there... until this year. In June, I started noticing adverts in several London Underground stations and people around me started organising trips to Edinburgh. I had friends coming over to visit from abroad so I thought it would be a great idea to take them up to Scotland - they would see a new country and experience the buzz of the Fringe Festival. According to the 2015 Festivals Edinburgh Impact Report, Edinburgh’s twelve festivals generated £280 million in Edinburgh and £313 million in Scotland. 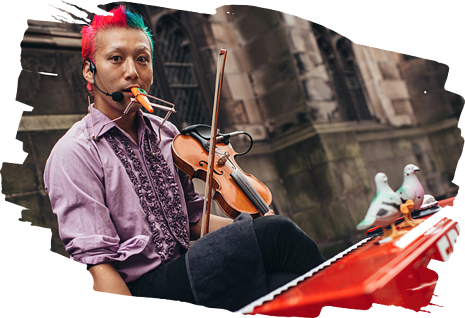 Last year, the Edinburgh Fringe Festival alone, hosted 50,266 performances of 3,269 shows in 294 venues! Out of the twelve festivals, the Fringe is known to have a much larger audience than other festivals and therefore a larger economic impact on the city and Scotland as a whole. Huge tourism follows, promotional benefits, significant contributions to local and national identity, pride and environmental benefits. I know Edinburgh without the Fringe - it’s still as nice but definitely less busy. Here’s an example of the Royal Mile Street (The main street of the Fringe Festival) on a regular day versus during the festival. 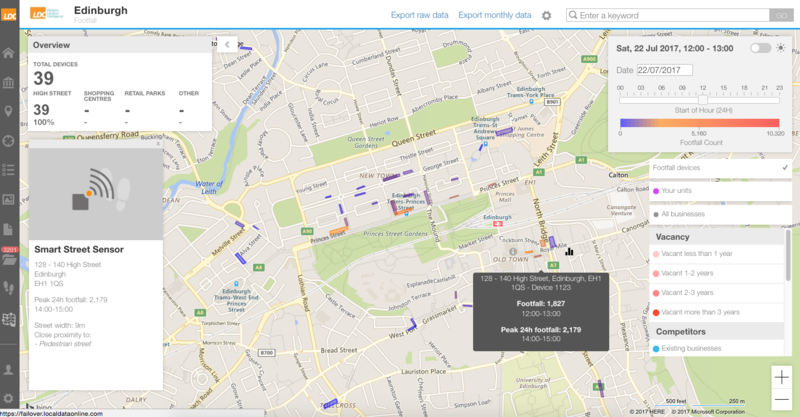 I asked Chris Fowler, Relationship Manager at LDC, to give me a hand with some data around footfall in Edinburgh during the month of the Fringe using LDC's New Footfall Heatmap Dashboard. How does August compare to other months in Edinburgh? 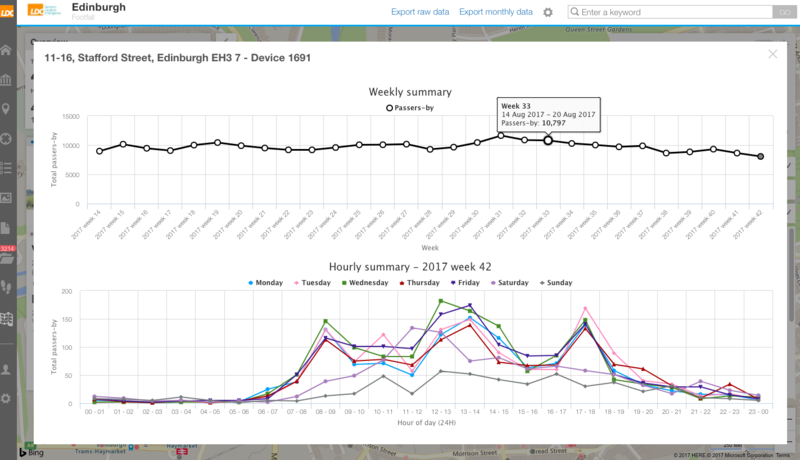 “I think the key pattern is that some of the ‘hot’ areas in July became even hotter with the festival in August – especially along Royal Mile where Saturday peak footfall shifts from 2-3pm to 12-1pm compared to mid-July” Chris said. ∆ August 19th, our sensor between 128-233 on High Street, has a footfall of 6,603 (12:00-13:00) and a peak 24h Footfall of 8,248 (13:00-14:00). ∆ August 16th, our sensor between 128-140 High Street, has a footfall of 2,742 (12:00-13:00) and a peak 24h Footfall of 4,067 (17:00-18:00). ∆ Peak in footfall in August during the Fringe Festival. Highest peak being between 07 and 13th August 2017 = 475,104 passers. 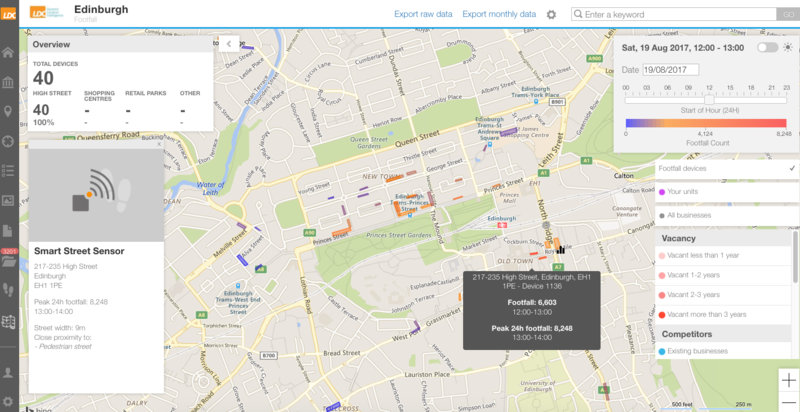 At the weekly level, some of the ‘smartstreetsensors’ saw footfall volumes almost doubling during the festival weeks. 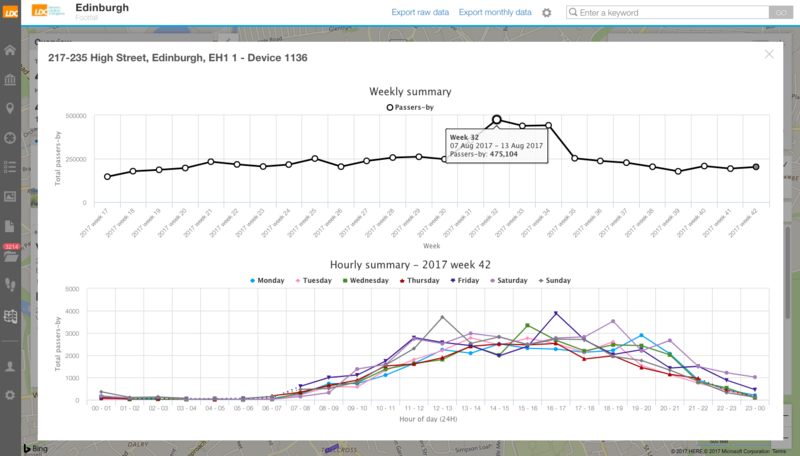 Footfall volumes are more significant than the Christmas period / Hogmanay (Scottish celebration of the New Year) to many parts of the city. 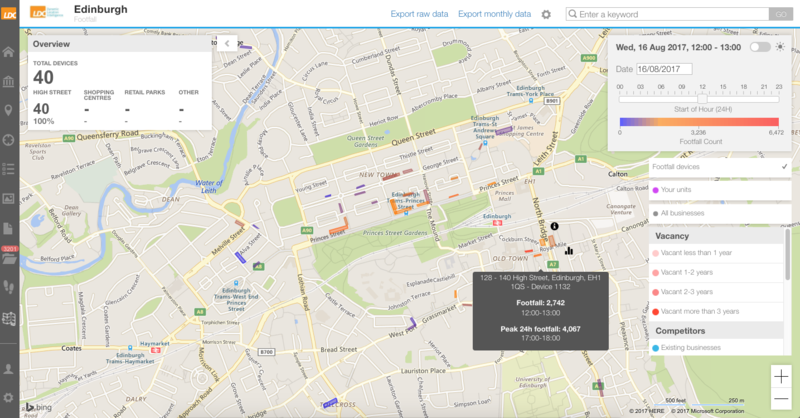 For example, footfall along some parts of High Street was almost half a million per week during the festival (compared to c.250k per week in July). Other locations showed almost no uplift from the festival. For example, Stafford Street in the West End saw footfall increases of no more than 6% for the festival weeks compared to the rest of the summer. The vacancy rate within 200 metres of occupiers in this area ranges from 9% to 11%, compared to an average of 7.5% for the city centre as a whole. This indicates that the area is a less attractive retail destination and that even during massive events such as the festival, some of the more peripheral areas only see small gains. ∆ Stafford Street in Edinburgh is less of a retail destination - It has a number of offices nearby. Peak footfall is between 8-9am, 12-2pm and 5-6pm. The impact of events on a location can be complex. 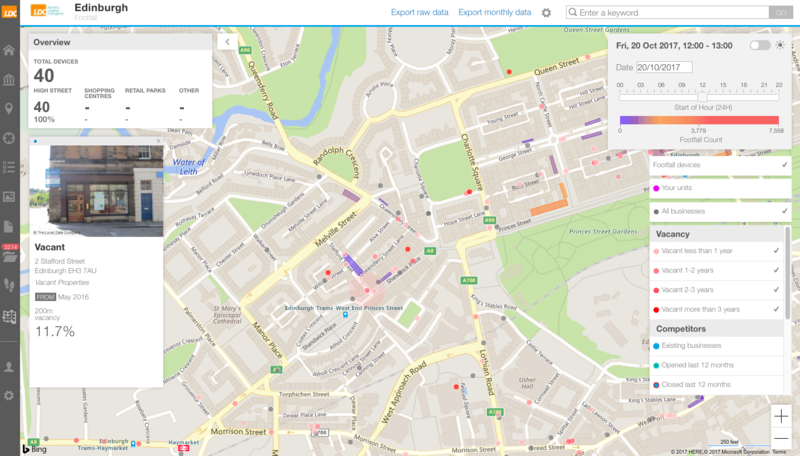 Therefore, monitoring footfall is a great way to evidence changes in activity. We only really get the full picture by having a network of devices that highlight the nuances of different areas. 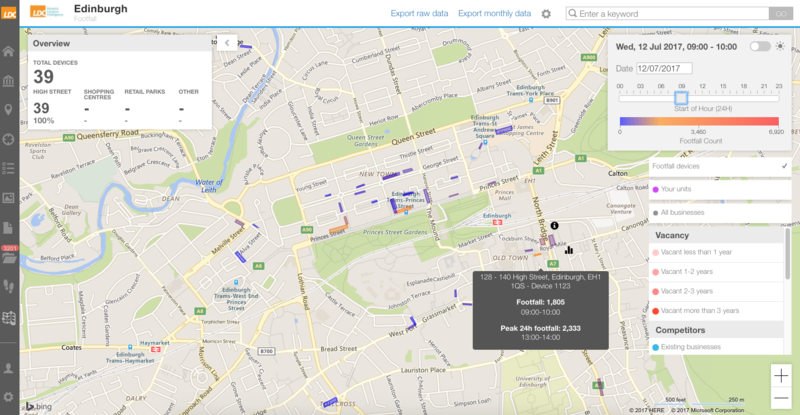 More detail on the different patterns in Edinburgh’s footfall is available in the monthly report by Essential Edinburgh BID here.